As Eduard continues to release 1/72 Spitfire versions they'll also release their own aftermarket for them. And why not? When one of the aspects of modeling you're good at - in this case aftermarket - then continue release aftermarket pieces for their own kits. That gives you, the modeler, a choice. Any of the 1/72 Spitfire kits can easily be built out-of-the-box and still be a great model, or go ahead and super detail that model to your heart's content. 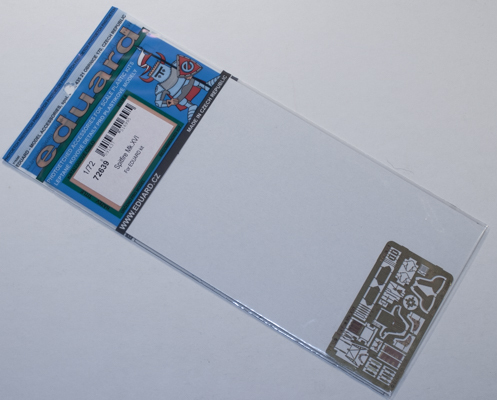 For this release, Eduard has a photoetch set for their 1/72 Spitfire Mk.XVI. Since the kit can be built as the "low" or "high back" version, naturally they will have photoetch to cater to both versions. You will need to make that decision with this set as there are photoetch pieces meant for either. And that comes to play in the version first step as Eduard has provided parts for either sub-type and its seat framing. 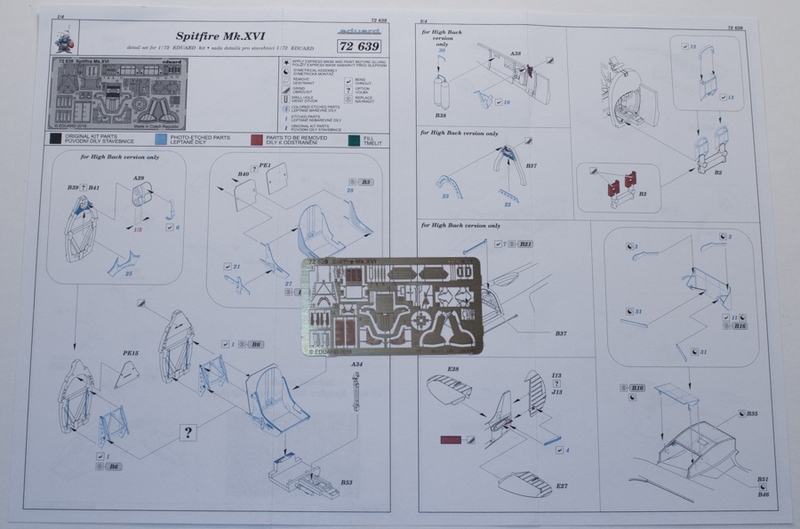 The set also contains a fold-up, seat replacement and seat belts; more items to add between the seat and the main bulkhead-frame; items to add to the sidewalls; replacement rudder pedals; the bar that sits between the seat bulkhead-frame and the fuselage for the "low back" version; pieces to create the back end of the under-wing radiators; replacement rudder actuators; replacement main landing gear doors; a replacement cockpit door (that contains other, smaller pieces); replacement fins for the external bombs; and sway braces that sit between the external bombs and pylons. So if you're looking for more to add to your Eduard 1/72 Spitfire Mk.XVI then you'll want to pick up this set. I send a "thank you" to Eduard for this review sample.